Use this coupon code today to save 20% off regular priced skincare from Borghese. Save $10 off any order of $49+ with this coupon code from Borghese. 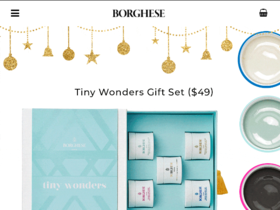 Act now and take advantage of Holiday specials from Borghese.com! Check out Borghese online for their latest special offers. Enjoy free shipping all day everyday from Borghese online.